Bleed provides additional image area to a file. It allows us to run your job slightly oversize and cut it down to its final size. 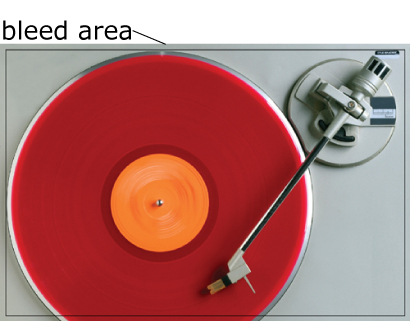 We prefer you submit your files with an 1/8" (.125") bleed on each side. This increases the width and height by 1/4" (.25 in). For example, an 8.5 x 11 flyer with bleeds is setup as 8.75" x 11.25" file. Please make sure your images are 300 dpi (dots per inch). If you right-clicked and downloaded your images from a website, they are likely low resolution (72 dpi) and not suitable for print. We recommend purchasing photos from a stock photography website, or working with a professional graphic designer or photographer. If your file contains transparency it is critical to flatten the transparency before printing. In most cases, flattening produces excellent results when you use an appropriate predefined flattener preset in InDesign or Illustrator.